Could this mean future revival of extinct species? Last week, the US Defense Advanced Research Projects Agency (DARPA) created a program called “Safe Genes” with an award of a $65 million in research funding. Seven research teams will share the funding, all dedicated to the broader goal of improving the accuracy and safety of CRISPR gene editing techniques. 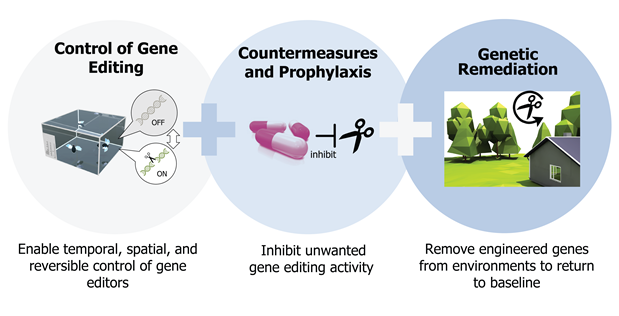 DARPA’s stated goals include improving the understanding of gene editing technologies, more predictably harnessing them for beneficial uses, and addressing issues of intentional or accidental misuse that could caused potential health and security problems. Image Credit: DARPA[/caption]The “Safe Genes” program sets forth three technical objectives, and each of the seven teams housed under the program will be assigned at least one of them. DARPA sets forth these objectives as follows: “develop genetic constructs — biomolecular “instructions” — that provide spatial, temporal, and reversible control of genome editors in living systems; devise new drug-based countermeasures that provide prophylactic and treatment options to limit genome editing in organisms and protect genome integrity in populations of organisms; and create a capability to eliminate unwanted engineered genes from systems and restore them to genetic baseline states.”The seven teams from different research institutions will be focusing on different areas of research, from developing an “on and off” switch for genome editing in bacteria, insects, and mammals in order to take aim at diseases like malaria, to safeguarding genomes by detecting, preventing, and reversing radiation-induced mutations. This kind of work, improving our understanding of CRISPR and how it works, will ideally help settle spats about whether the technique causes mutations and other scientifically controversial issues. The ethical and safety components of the project may also defuse controversies about using CRISPR to revive extinct species or create new ones.